In his commentary in The Nationalist on the county final, 'Westside' referred to John Leahy's 'salmon-leap' over a pair of players for the final ball in the match. It was a wonderfully descriptive and appropriate metaphor to describe the action of the player: Mullinahone had fought long and hard, overcome all kinds of obstacles and difficulties and needed that final leap of defiance to get them to the spawning grounds of success. And it was equally appropriate that Leahy should be the man to deliver that final act of defiance. He has been the inspiration behind the development and success of hurling in what was a traditional football area. His performances over fifteen years, for club and county, have won more plaudits than any other player. His very presence on the field evokes a special response. 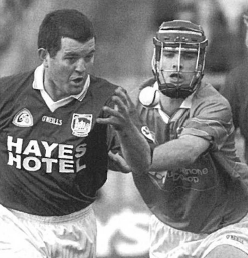 One recalls the ovation when he came on against Clare in 2001 and, of course, the belly-deep roar of appreciation when he made that leap in the final. These are only two in a litany of great occasions he has provided for his supporters and admirers down the years. The county championship had a new format this year. The number of teams taking part doubled in number as all participants in divisional semi-finals qualified, thus increasing the number of teams from eight to sixteen. It was thought that this development might have the effect of downgrading the divisional finals, but such does not appear to have been the case. In general the new format was well received. It may have added one weekend to the fixture crux but it gave teams greater opportunities and a longer run in the championship. In the case of Thurles Sarsfields it gave them six extra games they wouldn't have had last year, even if the final one wasn't a happy experience. It brought teams into opposition that normally don't get an opportunity to meet. Cashel and Roscrea hadn't played in championship since 1981. It was good for income, not only for the county board, but for clubs who hosted games as well. It was brought in for one year but the likelihood is it will continue . The format of the county championship was as follows. In round one the eight beaten semi-finalists played off to produce four teams. In round two these four teams played the defeated divisional finalists. The four winners played the four divisional winners in the quarter-finals, from which followed the semis and final. The beaten semi-finalists were drawn against one another on a divisional basis, with the South playing the Mid , and the North playing the West. Each division had a success with Thurles Sarsfields defeating Carrick Swans but Holycross-Ballycahill losing to Ballingarry. In the North-West confrontation Roscrea defeated Cashel King Cormac's but Portroe lost to Galtee Rovers, after a hotly disputed goal by Larry Quinn minutes from the end grabbed victory for the West side. Interestingly three of the qualifiers survived the next round, Galtee Rovers being the only team to bow out. Killenaule, the beaten South finalists, defeated them at Cashel by 3-6 to 2-7. Thurles Sarsfields defeated the West final runners-up, Kickhams, by 1-16 to 0-14, also at Cashel. Roscrea overcame the Mid runners-up, Moycarkey-Borris by 2-13 to 3-8 at Templemore, while Ballingarry defeated the North finalists, Moneygall, by 0-16 to 2-9 at the same venue. Three of the quarter-finals were played at Semple Stadium on October 13. Toomevara had an unimpressive six-point victory, 1-16 to 0-13, in a game that was always interesting, even when the possibility of a Toomevara defeat never seemed likely. For Ballingarry there was the consolation of having held the county champions to such a margin. Mullinahone swept passed Roscrea in the third game by 3-17 to 0-9. They were in control all the time. Leading by six points at the interval, they had booked their place in the semi-final long before the final whistle sounded. The last of the quarter-finals was played at Semple Stadium a week later. Two goals up after eight minutes gave Loughmore-Castleiney an advantage they were never to relinquish. Two goals separated the sides at the interval. Ballingarry battled hard to overcome the deficit and were denied a goal on at least three occasions in the second-half. In the end they had to concede to the Mid men on a scoreline of 2-9 to 0-10. On a most unpleasant day, with the smallish crowd huddled together in the new stand in Semple Stadium – because of reconstruction work on the old stand - Mullinahone and Toomevara lined out on October 20 for the first of the semifinals. The North champions, going for five-in-a-row, were favourites to continue their success. With five minutes to go to the interval they led by four points, and should have been further in front had Tommy Dunne not missed three frees he would normally score. But five minutes is a short time in a hurling game and Pat Croke scored 1-1 during that period to send Mullinahone into the dressingroom happy to be level at 1-6 each. The good run for the South continued after the interval when Eoin Kelly pointed within twenty seconds to give them the lead for the first time. But that score acted as a spur to Toomevara who followed with four unanswered points. Mullinahone came back but Toomevara responded and put three points between the sides once again. The last quarter was a titanic struggle as the game hung in the balance. With five minutes to go Mullinahone were one behind when Paul Kelly levelled. Then in the 29th minute the same player sent a 65 metre free straight over the bar to give the men from Mullinahone the lead at a vital stage. It was the winner and try as they could Toomevara could not get back on terms and had to concede by 1-15 to 1-14.
including a hat-trick from Sarsfields full forward, Eamon Walshe. In a great game Loughmore-Castleiney led by 2-5 to 1-5 at the interval. With five minutes remaining the sides were level, 2-10 to 3-7, but in the remaining time Sarsfields scored 1-3 to put them into the driving seat, which they held despite a goal from a free by Pat McGrath with three minutes remaining. The final goal for Sarsfields was hotly disputed by the Loughmore backs, who claimed the ball hadn't crossed the goal-line. In the dispute that followed Loughmore corner-back, John Kennedy, was sent off, leaving his side a man short during the vital closing stages. So the stage was set for the county final at Semple Stadium on November 3, with Mullinahone going for their first championship and Thurles Sarsfields going for their 28th, even though the latter hadn't won for twenty-eight years. Whereas the South representatives were the popular favourites the smart money was on the traditionalists from the Mid , especially in the light of their having lost the previous two finals. Kelly, who retired in the opening minutes with a pulled hamstring injury. trick. They hit four points in a trot to reduce the arrears to 0-12 to 0-10. By injury time the score was 0-14 to 0-12 in favour of Mullinahone but Thurles got two points, a free from Stephen Mason and a last gasp point from Pat Lawlor ensured that they lived to fight another day. (Mullinahone) photographed during the county senior hurling championship final replay at Semple Stadium. In the replay a week later, Mullinahone's win was carved out in a great third quarter, inspired by Eoin Kelly. During this time they scored 1-5 without reply from Sarsfields, turning an interval deficit of three points into a five point lead. They also grasped the initiative, threatened briefly by a 'Redser' O'Grady goal for Sarsfields in the fifteenth minutes, and held on to it to the end. It was mostly Sarsfields in the opening half and they led by 0-9 to 0-2 after twenty-three minutes, with great work by Johnny Enright. Two minutes later, however, Eoin Kelly was in like a flash to pounce on a poor Sarsfield's clearance, from a long Leahy delivery, and bury the ball in the net. This score ignited the Mullinahone challenge, they got another point before the interval, and went into the break three points behind, 0-9 to 1-3. Kelly and Mattie O'Dowd and Johnny Enright replying for Sarsfields. Mullinahone deserved their victory. They showed wonderful focus and concentration after an inauspicious start. They had a star performer in Eoin Kelly who contributed 2-7 of his side's 2-10. They had a number of other fine displays, from Brian O' Meara, Edward O' Brien and Niall Curran in particular. John Leahy showed flashes of brilliance and his final catch reflected the determination and the do or die spirit of the side. For Thurles Sarsfields it was another huge disappointment. Their display in the first twenty minutes was scintillating and then, as so often happens with this team, numerous players just went out of the game. Consistency appeared totally lacking. Vincent Doheny, Dermot Hackett, Paul Curran, Tony Dalton, Ky Vaughan (capt), Edward O'Brien, Philip O'Shea, Eddie Carey, Niall Curran, Conor Arrigan, John Leahy, Brian O'Meara , Pat Croke, Noel Leahy, Eoin Kelly. Subs : Joey Maher for N. Leahy, Paul Kelly for C. Arrigan, Edwin O'Meara for E. Carey. Others: Alan Curran, Martin Costello, Stephen O'Brien , James Connolly, Bill Tobin, James Comerford, Danny Morrissey, Mark O' Brien, Niall Doheny, Dan Croke, Aidan Hall, Damien Maher. Selectors: John Leahy (manager), Sean O'Regan (trainer), Michael Scott, Sean O'Meara , Sean Brett. Physio: Jill Snell. Doctor: John Gilman. Ciaran Carroll , Seamus O'Shea, Tommy Maher, Gary Mernagh, (capt) John Lawlor, Brendan Carroll, John Lillis, Catha! McIntyre, Eddie Enright, Matty O'Dowd, Lar Corbett, Ger O'Grady, Tony Ruth, Pat Lawlor, Johnny Enright. Subs: Eamonn Walshe for T. Ruth, Eoin Costelloe for J. Lawlor, Stephen Mason for C. Mc Intyre. Others: Barry O'Dwyer, Tommy Collins, Brian O'Grady, Tony Connolly, Tom Ryan, Lee Shanahan, Wayne Cully, Willie Collin s, David O'Dwyer, Colm O'Rourke, Eamon Tuohy, Brendan O'Sullivan, John Connors. Selectors: Paddy Doyle (manager), Paddy McCormack (trainer), Tom Barry, Denis Maher, Br Daithi Fitzgerald. There was a relegation part in the new county championship system. Any team that didn't reach the semi-final stage in the divisions played for relegation. The following are the results. Upperchurch 2-8, Silvermines 1- 11 in Templederry on 3/8. Upperchurch 1-21, Silvermines 2-9 in The Ragg on 17/8. Borrisoleigh 5-15, Golden 0-7 in Holycross on 3/8. JK Brackens Boherlahan in Littleton on 31/8. Silvermines 3-12, Templederry 0-17 in Toomevara on 24/8. Boherlahan 2-19, Golden 3- 14 in Cashel on 14/9 [aet]. Templederry 2- 17, Golden 1-13 in The Ragg on 21 /9 (aet). Nenagh Eire Og 4-12, Cappawhite 4-7 in Newport on 3/8. Drom- lnch 2-19, St. Marys 2-17 in Cashel on 24/8. Cappawhite 3-15, St. Marys 0-14 in Cashel on 31/8.